UPDATE: 5/5/2017 – The mother has been formally charged – details here. The Middle River mother shown abusing her children in a viral video that surfaced on social media last week has been charged with second-degree child abuse and second-degree assault. Rachel Marie Pietro, 26, of Middle River, was arrested on Tuesday morning by Warrant Task Force officers at a location in Essex. 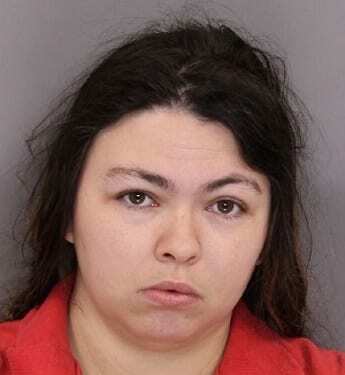 She is being held without bail at the Baltimore County Detention Center. She faces two counts of each charge. Patrol officers from the Essex precinct visited Pietro’s home at 1:26 a.m. on March 16, after many concerned citizens forwarded to police a video showing a woman repeatedly striking two young children, a boy and a girl. Officers spoke with Pietro and her husband and referred the case to the Crimes Against Children Unit. Detectives from the Crimes Against Children Unit visited the home the next day and began an investigation. The two children in the video, a 5-year-old boy and 6-year-old girl, as well as a 2-year-old boy who does not appear in the video — were placed in the care of the county Department of Social Services and subsequently transferred to the care of family members. The investigation shows that Pietro – who initially told police the video was two years old – recorded the video some time within the past two months. She said she recorded the video because she hoped it would encourage her husband to come home and take care of her. She also said she was angry with the children.